You have already learned the verb TENER (to have). TENER is a very important verb. It is used to express something one “has to” do. It is also used in many expressions that do not translate easily to English. These are called IDIOMS. TENER + QUE + INFINITIVE means that someone “has to do something”. 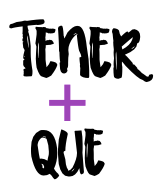 “Tener” will be conjugated appropriately for the person doing the action and the second verb (in the infinitive) will express the action that they “have to do”. Don’t forget “que”! This is a 3 part verb! Paco tiene que estudiar para la clase de ciencias. HAY + QUE + INFINITIVE means that “one must do something” or “it’s necessary”. This compound verb is very simple in that you do not even need to conjugate anything. “Hay” stays the same because it refers to “one” which is vague and then the second verb (in the infinitive) will express the action that they “must do”. Don’t forget “que”! This is a 3 part verb!